It’s very important to devote 1 to 2 hours daily on newspapers during this period. Should the interview call come, current affairs should be on your tips. Otherwise, this part is often neglected during the preparation of Detailed Application Form for the interview. Since most of the topics of general awareness you already know by this time, you can read the paper very effectively by this technique. Before jumping to read any newspaper article, just read the title of the article. Brood over the topic and jot down all the points that you already know about the topic on the side of the article. Now quickly read and search through the article whether you have left any point. If yes, quickly add the point to your already remembered points. After reading the article, try to place the topic of the article in a broader context. For example, after reading an article on ‘Increase in the number of Indian billionaires in Forbes list’, you should try to place it in the context of ‘Effects of Neoliberal Policies in the last two decades’ or ‘Rising levels of Inequality in Indian society’. After placing it within a broad topic, try to think of other examples of that broad topic and link them with the original article. It’s a real engaging exercise. These two techniques help to produce answers on those topics that are relatively new and unprepared. Since there is actually no dedicated study to do in this phase, try to join some start-up, coaching institute or some NGO to keep yourself engaged. Some financial help is always confidence boosting. But besides the financial gains, it helps to divert the mind away from the drudgery of daily preparation of one whole year and assists you to make yourself mentally ready for the next attempt, if the need arises. This might be the best time to finish off those good books that you always wanted to read. But the question that is asked commonly is why should I read books? 1) First reason, just for the sake of reading books. The following anecdote explains this point beautifully. Son, that’s what happens when you read the book. You might not understand or remember everything, but when you read it, you will be changed, inside and out!!! This story above uses a holy book as example, but applies to any book you read. This is the implicit, quiet effect of reading books. Books help to refine your though process gradually. Remember that there are no shortcuts to success and modes of instant gratification like YouTube or Quora can never replace books. 2) Direct benefits in interview. Although it is very coincidental, but the answers in the interview can be directly given with the help of knowledge gained through the books read during this period. I was lucky enough that I gave 1 answer directly from “7 habits of highly effective people” by Steven Covey , 2 answers from “Demon Haunted World” by Carl Sagan and 1 answer from “Argumentative Indian” by Amartya Sen.
3) Since you are preparing for civil services, it’s assumed that you have a non-existent social life. To get back into social discussions, read some bestsellers to again participate in ‘normal’ conversations that do not involve Democracy, Fundamental Rights or Marx vs Market issues. Congrats for getting the interview call. It’s time to take out that Detailed Application Form that you carelessly filled post the prelims results. Get some 5-6 printouts/ copies of this application form since now you would need this form a lot. You would definitely be amazed to look at the hobbies and games filled in the summary sheet. As Kashish Mittal (2011 batch IAS Officer, AGMUT Cadre) points out, the topics to prepare for interview can be subdivided into two, viz. Must Know Topics (education background, issues of your locality, reasons for joining services, graduation subject broad topics, optional broad topics, work experience details, broader topics of your hobbies and games, achievements, family background etc.). “I don’t know” is not an acceptable answer to such questions like “What’s the meaning of your name?” These topics you must know and not answering on these topics would invoke negative marks. Should know topics (all the happenings going on in the country and the world in the recent times, micro level topics involving your graduation, job, state and hobby). As I often say, UPSC personality test is one of the only interviews in the world where “I don’t know” is an acceptable answer. Since the scope of interview is very wide, you are not expected to know each and every thing happening under the sun. Hence, not answering such question does not invoke penalty, however it’s a bonus if you can answer these questions.As a corollary to this point, it would be appropriate to say that you do not need to delve into micro details of each and every topic that you can think of. UPSC interview board does not expect you to be a supercomputer know-it-all. You need to be thorough with your state’s major topics: Demography, Challenges, Inter-State conflicts, Agriculture, Industry, Culture, History, Major tourist spots, Weaknesses, Unique Opportunities, Resources etc. State Development Reports (SDRs) published by the government are available for each state. They are quite comprehensive. State Government websites are also useful. If no other resource is available, then you can also go for NBT books available for each state. This is the most feared part of UPSC interview. It’s advisable to write one or at maximum 2 hobbies. You should be clear with broader contours of your hobby. Let us take Sketching as an example. Types of sketching, Techniques of sketching, Some famous painters/ cartoonists, How sketching would help you in IAS, Issues related to Right to Freedom of expression, M.F. Hussain issue, Khajuraho Paintings, what is your inspiration are some of the must know questions. At the same time, some should-know questions may include comparison of various forms of paintings, paintings in temple architecture of India, Photography vs Painting, Schools of Painting etc. You should be thoroughly familiar with your Schools, Colleges and Employers on a broader level. Again, do not explore into detailed history but a cursory knowledge over important topics like meaning of the school name should be there. The important peripheral issues related to your background should be adequately addressed. Let us take IIT as an example of your college. Questions like Change in standards of Alumnus, Brain drain, Loss of engineer if you join IAS, Entrepreneurship culture, Why IAS after IIT, Opening up of new IITs, Autonomy of IITs etc. should be prepared with diligence. Details like significance of date of birth, significance of your name, family background, service order, cadre order, giving other exams etc. should be looked into. Again falls into the must know topics. Should be thorough with these things. Peripheral questions like how they have impacted your personality, key learning for life etc. should be prepared. Continue reading newspaper. This time of the phase demands two newspapers, one a bit right of centre and other a bit left of centre. The two techniques stated above will be more than helpful in this phase. Basic topics related to your graduation subject are expected but they are less likely to be asked if you have a prior work experience. You should be thorough with your optional as many questions will be related to the optional directly or indirectly. It’s a good practice to form groups for interview preparation. Form a group of around 3-5 friends (group of 3-, too less diversity while group of 5+, too much time pass). Take mock interviews of each other once a day. Blatant and explicit flaws will be easily pointed out and the basic common questions will be practiced. Also, you come into the flow of giving the interview. The correlation of mock interviews with scoring high marks in the interview is a debatable topic. Yet, I would suggest that if you have never given a mock interview, then giving 1 or 2 mocks would be helpful to get some unambiguous and clear-cut errors pointed out to you. However, the feedback of the mock interviewers should not be taken very seriously. Different mock boards may give contradicting feedbacks. You should not try to modify your personality too much before the interview. Be yourself. This time you will be entering UPSC through the main gate unlike the Mains exam. Remember to carry the invitation letter of UPSC Interview and an I-Card. Upon entering the UPSC, your mobiles will be deposited and you will be made to sit in the main hall on the tables distributed board wise. Water, Tea etc. is available in the hall. Have some friendly conversation with people sharing the same board. Some of them may become friends for life. Once the documentation verification is done, the interviews will start. Remember that concerns like whether the interview is first, in the middle, at the fag end, before or after the tea/lunch break are really immaterial. The interview board is daily taking some 10 odd interviews for many years. These things are really immaterial as compared to what happens during the interview. Similarly who goes before you or after you may have some effect but it is negligible as compared to the blunders committed during the interview. Also, no board is good or bad. Every board has the history of giving good and bad marks. Do not prepare your interview aiming to press a board member, just be yourself. So, look forward to your interview without any prejudices. Newspapers are placed on the table where you are seated. Do read the headlines and if possible, the editorials too. Discuss the issues with the other board candidates as it will help you to come into flow of interview. Freshen up before your name is to be announced. You need to wait in front of board room for some time after your name is announced. Upon entering the room, politely wish all the members starting from Board Chairman or the lady board member. Note that there are no hard and fast rules for these things. Similarly, upon taking permission for sitting, you should sit comfortably and there is no one particular stance of sitting. While conversing, you can move your hands a few times (there are no strict rules against it) but it should not come out as an obsessive habit. Rather this is true for each component of the personality test, do not overdo anything. One thing that should be avoided at all costs during the interview is lying. Lying may offer you a little benefit but if the lie is caught, then the whole interview is over then and there. There is nothing more appalling to the UPSC board than a candidate without integrity. Tendency to make guesses should be subsided. Wrong guess reduces the credibility of the person. Everyone candidate knows this fact but as soon as the candidate fails to answer two-three questions, urge to make a guess increases. Firstly, avoid making a guess but in case you cannot control it, ask for permission to take a guess and only then take an informed guess. As I wrote before, UPSC Personality Test is one of the rare interviews where “I don’t know” is an acceptable answer. Use this freedom fully. In a stress interview, the board may ask more than 5-10 such questions to whom you can safely give “I don’t know” as the answer. The board may also go a step further and taunt, “You don’t even know this”. Simply, avoid the urge to lie or guess. Just smile, say sorry and carry on with the interview. Remember that personality test is not a test of your knowledge but your personality. So just be yourself, smile and face the interview board with full confidence. Also, one important point to be noted is that this might be the most crucial day of your life and you rightfully expect full attention from the board. However, thinking from their perspective, you are one of many candidates who appear before them daily. So, it’s not a big deal if the Chairman is doodling or getting up for a break. Just be cool, smile, and carry on. Avoid taking stress during the interview. However, in you feel stresses, with the permission of the board, get a sip of water placed in front of you. Helps you to frame your answer. Assures the board that candidate is thinking on his/her feet. Gives time to the questioner to re-frame his question in a simpler format allowing him to give you a hint as to what answer he expects. If you want more time beyond 5 to 10 seconds, you can always ask for some time to think from the questioner. It is considered a good habit (but do not overdo it). Also it boosts the ego of the questioner that he has asked a brilliant question, which would go in your favour when marks are awarded. This is a common confusion among many candidates whether to take stand in interview on any issue or be diplomatic by giving both pros and cons and avoiding the stand. Always remember that they are looking for decision makers. You have to take a stand. There is no other option. But the only caveat is that your stand should not be fundamentalist or too radical. What should be the expected level of command over English? Well, that depends on your background. If a person is convent educated or has studied in a good institution like IIT, then a good command of English is the bare minimum expectation of the interview board. But if you come from a rural background, then very good command over English is not expected and if you present one, then it works as a bonus. 2) Allotting last 10 minutes for circling: Ensures no time wastage but the last 10 minutes of the exam are filled with much anxiety and tension. Marking in such a mental situation can lead to poor accuracy in marking of bubbles. And if you are marking continuously and unfortunately miss a question, the whole answer sheet gets corrupt. HUGE LOSS!! I have a nice technique that I have been following since the days of AIEEE and JEE. It is based on Binary Algorithm. 1) Just divide the remaining time in 2 halves and mark the bubbles after the end of 1st half. 2) In the 2 hour paper, after 1 hour mark the bubbles of the attempted questions. Low level of anxiety (1 hour is still with you) ensures avoidance of silly mistakes. 3) Now attempt the remaining questions and mark the bubbles after (½) an hour i.e. 1½ hour after starting of the exam. 4) Following this pattern mark the bubbles after 1 hour 45 minutes. 5) After this third marking of bubbles, you can switch to marking of bubble side by side with the attempt. Keep your resources limited to whatever you can revise at the end. Please do not go for humongous books like Jain and Mathur (World History) OR Tata Mc Graw Hill Complete GS (1000 page books) OR Huge volumes of Economy Books. Also do not subscribe to multiple magazines or for that matter multiple newspapers. Read only those resources that you may be able to revise at the end (say last 1 month). In order to revise a year’s material in last 1 month, make compressed notes. In order to facilitate quick revision just before the exams, I made my notes in the format of mind maps. Mind Mapping is a great learning tool which helps to store information in our minds in a non-linear fashion facilitating easy retrieval. While depending upon linkages of different topics, it enhances retention. It’s a tool worth exploring. There is nothing more frustrating that the feeling when you come out of examination hall and realize that you knew answers to some 20 marks worth questions but could not attempt due to paucity of time. More than writing speed, it is about alertness during those 3 hours. Always be on your toes. There is not a single second to be wasted on some lazy stretch or yawn. Forget going to the loo. One cannot afford to be complacent. There is a cliché advisory that everyone issues, “Write what IS asked, not what YOU know”. We hear it umpteen times yet many of us fail to follow this golden rule. I myself have made this mistake of not following this advisory in 2012 Civils Examinations. Always keep this advice at back of your mind before attempting any question. Writing stuff that is not asked is not only going to fetch you NO MARKS but shall also waste the precious time that could be invested in other answers. If you know less, write less: no issues but never go for redundant stuff. Answer writing practice is a must. Make a peer group of around 2-4 people and write answers on a daily basis. Cross-check each other’s answers and make suitable amends. Do not wait for the day when you will have enough content in order to write answers. Believe me, such a day would never come. Also, Test Series can prove helpful if you are indifferent to marks (Marks in the tests tend to shift the focus from the aim of Test Series) but only interested in giving Tests and attending their discussions. I would like to suggest the aspirants to subscribe to RSS Feeds of All India Radio and listen to News and Spotlight: a 15 minute discussion on a current issue daily. Preferably make notes of the same. There are many good resource available online like Mrunal, Halfmantr, Yojana Magazine, Rajya Sabha TV, MEA, Jagran Josh, Okkal, Centre for Policy Research, PRS, GKToday, egyankosh, pib, idsa etc. But the problem with online resources is that they are often repetitive and tend to waste a lot of time. Therefore, my advice would be to go to these sites with some particular aim in mind and then close them. For example, today let us make notes of Disaster Management. Now look for the specific need, make important notes and thereafter shut down the site. They should not be browsed and looked for what’s the new content that they have. Preferably make them topic wise and not date wise. Also revise these notes once a month such that you know what topics you have already covered. It helps in redundancy of notes and the placement of new points at appropriate places. If you are making newspaper notes very holistically then there is no need of a magazine. But in case you tend to be lazy (like me) then one magazine is essential. I went for Wizard. It’s a good magazine especially for Bilateral and International issues. 1) Yojana and Kurukshetra are indispensable for clearing this exam. Kurukshetra has little importance and Yojana should be read only if time permits. It can be left without much loss considering the new pattern of examination. 2) NCERTs need to be done from 6th to 12th for History, Geography, Polity, Economics, Sociology, Science etc. Again only NCERTs of 11th and 12th (preferably old ones) are sufficient to cover the entire syllabus taught from 6th to 12th. They can be left altogether if the relevant topics are covered effectively from other sources. 4) An IAS aspirant should know all historical dates, capitals of all nations…. rather every fact under the sun. Since the past few years, the exam has become quite analytic and mugging up of strange facts (chronological order of least important later Mughals) and who’s who (Heads of UN Bodies) is no longer required. 5) Minimum 3 newspapers are required to be read on daily basis. 1 newspaper is more than sufficient for Mains. For interview, 2 newspapers can be done for just 2 months before the interview. 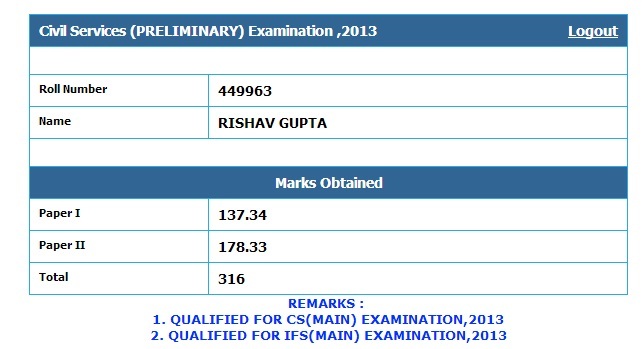 Standing on the shoulders of Giants like Kashish Mittal (Civil Services AIR 58) , Amrit Singh Saini (IES AIR 1) and a few others, I started the preparation of Physics optional. I got a score of 266/500 in Physics ( 145/250 + 121/250). Here I would like to mention a few pitfalls and strategies regarding Physics that I realized during the preparation of this optional. My sincere request to every serious aspirant out there is to choose one’s optional carefully. Please do not blindly follow the rat race. Just because your friend is taking/ or has cleared with Public Administration or Geography or for that matter Physics, does not make that subject suitable for you. Every optional needs some interest and basic aptitude. Give a cursory reading to a few optionals before deciding yours. I ,myself, gave a try to Political Science (10 days reading) , Sociology (did a Sociology course at IITD ) and Electrical Engineering (my Graduation subject) before settling for Physics and Geography in 2012 attempt and finally for Physics in 2013 attempt. Take Physics only if you like this subject and can solve its problems for hours without feeling bored. I took coaching for Physics at DIAS, Jia Sarai, Delhi under the able guidance of Professor Vajpayee. He is a wonderful and passionate teacher. Only he can cover the whole Physics Syllabus within 4 months. Besides Physics, he taught us the art of answer writing, covering the syllabus ‘holistically’ and other finer points related to this peculiar exam. I also joined his Test Series. It proved helpful in improving my Physics answer-writing. Behind the Chapter questions of all the books that I have mentioned above. There is a major difference in IIT – JEE and UPSC Exams. In the former, we do not need to memorize much, once we have understood the basics. But in the latter case, there should be no illusion regarding the fact that even in Physics, there is a lot of mugging up. You should have all the derivations on your finger tips. Some derivation in Paper 2 are more than 4 pages long. All the steps (substitutions, normalizations, calculus) in such derivations should be remembered by heart. In many cases, there is no alternative to rote memorization. Therefore, my serious advice to all the Physics guys preparing for Civil Services or IFS is to know your notes by heart. You should be able to derive the quantum states of a simple harmonic oscillator even in semi conscious state after waking up. I am not kidding. Its preferable to make you own notes. But in case you have not, you can refer to few of the notes available including those of Abhijeet Aggarwal, Supreet Singh Gulati or even my notes. Always use a spiral binded notebook to make notes so that there is a option of adding in more pages afterwards. Start a fresh lecture from Right Hand Side page. You will understand its importance once you start adding more pages in between. Again this is not JEE where one get 100% marks for correct attempt. Even for a correct answer, UPSC awards 50% to 70% of the total marks allotted to a question, the variation is all about answer-writing. I attempted both the papers fully. But my correct attempt in Physics was ~230/250 in Paper 1 and ~240/250 in Paper 2. I got 145 and 121 respectively. So my advice is to attempt full paper ALWAYS. Even if you have some idea, answer it rationally and try to keep the attempt maximum. If your attempt is less, you are automatically out of the race. As per the latest pattern, the number of holidays for Physics Exam have been reduced from ~10 to 0. Therefore, it makes a lot of sense to make small summary sheets (~5-6 pages) for each unit to revise in half an hour just before the exam day. Note that some topics in the attached documents appear to be crossed out. This is due to the limitation of Black and White Scanning of Marker-Highlighted Text. Ancient and Medieval History: One difference between Civil Services and IFS General Studies is that the latter also covers Ancient and Medieval History in the written examination. Most of the candidates usually leave out these topics due to their sheer vastness. And 20 odd marks can make all the difference in the final list. Fortunately, there is a shortcut. Magazines like Chronicle/ Wizard etc. come out with Prelims Special Issues annually. The History Special Issue covers these 2 topics in 20-30 pages. Just do these pages thoroughly and most of the questions could be answered. Forestry optional helps in GK exam as 30-40 marks Questions are related to Forestry. Personalities: Undue stress should not be given to Personalities. Some institutes come out with some 10 pages long list of people who died/promoted/awarded/jailed etc. in the current year. Do not waste time on such lists. Out of say 10 personalities, 5 are so famous that almost everyone knows about them while 2-3 will not be covered anywhere how-so-ever long the list may be. Now for the remaining 2 or 3 entries, its better to stay away from such one-line facts. Same thing applies to Places. Attempt maximum: There is nothing more frustrating that the feeling when you come out of examination hall and realize that you knew answers to some 20 marks worth questions but could not attempt due to paucity of time. More than writing speed, its about alertness during those 3 hours. Always be on your toes. There is not a single second to be wasted on some lazy stretch or yawn. Forget going to the loo. One cannot afford to be complacent. To the Point Answer: There is a cliche advisory that every one issues, “Write what IS asked, not what YOU know” . We hear it umpteen times yet many of us fail to follow this golden rule. I myself have made this mistake of not following this advisory in 2012 Civil s Examinations. Always keep this advice at back of your mind before attempting any question. Writing stuff that is not asked is not only going to fetch you NO MARKS but shall also waste the precious time that could be invested in other answers. If you know less, write less: no issues but never go for redundant stuff. Answer Writing: Answer writing practice is a must. Make a peer group of around 2-4 people and write answers on a daily basis. Cross-check each other’s answers and make suitable amends. Do not wait for the day when you will have enough content in order to write answers. Believe me, such a day would never come.